Sometimes you just have to fry your food, and cold-pressed grape seed oil can make a nice alternative to chemically pressed vegetable oils. With a high smoke-point and a mild flavor, it can be used for just about any type of fried dish. Prepare your food for frying beforehand by breading or battering it, then get ready for some deep-fried perfection. Pour oil in the pan, to a depth of at least 2 inches. Set on medium-high and adjust your thermometer so that the tip sits submerged in oil but not touching the bottom of the pan. Raise the temperature to 350 to 365 degrees Farhenheit. If you don't have a thermometer, test the temperature by throwing in a small drop of batter. If it sinks, it's not hot enough yet. If it floats somewhere in the middle, it's ready. Don't let the oil smoke; this means it's too hot. Add your battered pieces, but not too many at once. The pieces should have room around them to float and sizzle. Adding pieces of food to fry will cause the oil temperature to drop, but that's okay; it will come back up to temperature as it's cooking. Use tongs to turn the pieces as they cook if they aren't completely covered. It should take less than 5 minutes to deep fry most food to the perfect golden-brown. The exception is larger, thicker pieces that may take more time to cook all the way through, such as large chunks of potato or meat. Once the food pieces are a golden color, remove them with tongs or a slotted spoon to a dish covered with absorbent paper. Eat the food items fresh and hot, or keep them warm for a little longer in a low-temperature oven. Used sparingly and as a treat, grape seed oil is a wise choice for deep frying because of its mild flavor and high-smoke point. 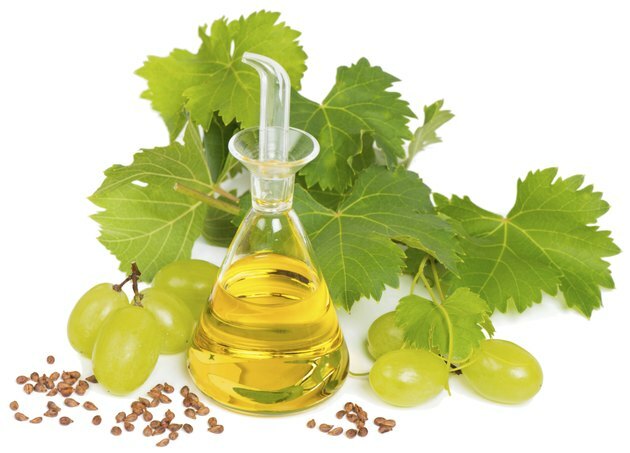 If you want a healthier oil for deep frying, grape seed oil may not be your best choice. It is high in polyunsaturated fat and omega-6 fatty acids. You may want to deep fry in coconut oil or lard instead, both of which are more stable at high temperatures and have better omega-3 to omega-6 ratios. Be careful of oil splatters. You may want to invest in a splatter screen if you deep fry regularly. Once cool, strain debris out of oil and discard, then store the oil for re-use. Don't dispose of used oil down a sink drain; it may clog the plumbing. Instead, use an old jar or oil container to pour it into, then discard the vessel into the trash. Immunitrition: Cooking With Grapeseed Oil or Rice Bran Oil -- Is It Safe? Can You Pan Fry Smoked Salmon?